Replacing a roof is not only about new shingles, it's about installing a complete roofing system that will protect your most valued assets for decades to come. At Chateau Roofing & Siding our philosophy is simple, exceptional products followed by quality workmanship and service backed by a unbeatable 50 year Registered Warranty. 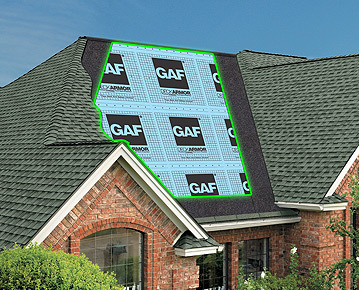 As a GAF Master Elite Roof Contractor we install products backed by leaders in the roofing industry. 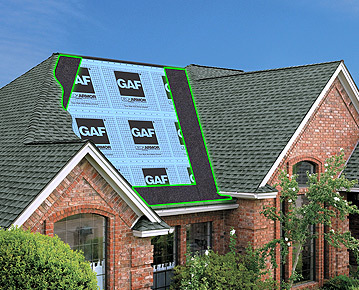 GAF has been the largest and oldest roofing manufacturer in North America, dating back to 1890. We begin by removing the shingles, underlayment, and vents from the house roof and inspect the entire roof deck surface for moisture damage and problem areas. When the job is completed all discarded material is carefully disposed of and when possible will be recycled. Ice & Water Protection is a leak barrier that protects the venerabled areas of your roof from water and ice damage, most notably the eaves and valleys. We install a 44" wide Leak Barrier/Ice & Water Protection on all eaves and valleys of the roof to provide maximum protection to these areas from damaging moisture entry. Roof underlayment provides a critical extra layer of protection between your shingles and your roof deck to help prevent wind-driven rain (or water from other sources) from infiltrating under your shingles and causing damage to your roof structure and the inside of your home. Some contractors do not install any roof underlayment before installation of shingles which will reduce the life of the roof over time. Starter Strip roofing shingles are one of the most overlooked parts of a roofing system. That’s because some contractors try to use a cut-up strip shingle as the “starter” course on your roof. Unfortunately, cut-up shingles may not have properly positioned adhesive to ensure adequate wind resistance. We install only the highest quality roof shingles currently on the market. By nailing 6 nails per shingle vs the standard 4 nails done by most contractors we can ensure your roof will stand the test of time. Once your roof system installation is fully completed Chateau Roofing & Siding's Quality Control Manager will personally come out to inspect the completed project. This allows any final questions or concerns you may have to be addressed immediately to guarantee your 100% satisfaction with your new roof system. Once completed Chateau Roofing & Siding immediately registers your 50 year GAF shingle warranty, allowing you the piece of mind of knowing you're roof is fully covered. Find out exactly what your registered warranty covers and why Chateau Roofing & Siding provides you a warranty our competitors can't beat!